Let’s say that one day, I wrote out the steps of a typical UCD-based process on a whiteboard (just pick any reputable textbook ;-)…and then someone walked into that room, memorized this process as a template or recipe and then executed it accurately — is that person now a designer? That’s exactly the question a professor asked our class, in the final weeks of a graduate design seminar at CMU, well over a decade ago. It’s an interesting question to revisit today, especially in light of the rapid emergence of many short-form certificate programs in design, as either free/cheap online video tutorials or startups funded to churn out so-called “UX Designers” on demand (after they pay hefty tuitions), to accommodate all the wild demand. Of course, anybody can be taught the rote mechanics of a tool or a process, as a sequentialized series of steps—the rawest form of tactics, that through incessant practice can become natural, intuitive like the muscle-memory of a piano player. But to become truly expert and valuable as such, requires a deeper level of engagement beyond simply 10,000 hours of practice. • Mechanics is that initial level of design practice (or activity, as “practice” implies a kind of behavioral rigor) for many entrants into the field, certainly those who are transitioning from other fields, possibly enamored of the “cool stuff” that may be created. Hey, that’s OK! It’s totally natural. You want to master the behaviors of tools and procedural sequence of steps towards creating and delivering something worthy of praise, or solves specific problems at a sufficient level. For the vast majority, this is perfectly acceptable as a goal and focal point to sustain one’s design aptitude. • Mindset is the next level of design practice, which requires a certain depth of forethought, around the purposes and values guiding the choices being made at the mechanics level. Understanding the “why”, the context (wherein constraints, contingencies, probabilities and possibilities, and thresholds for compromise all exist), and how they intertwingle to arrive at a nuanced appreciation for what’s really happening when design happens — this frankly is what separates the “newbies” from those seeking to go deeper. This requires patience and persistence and a mindset of curiosity, wonderment, skepticism, with perhaps a dose of provocation. Asking why not, or what if we don’t do it this way, and so forth are valuable. This provides the frame for applying the base level mechanics in a more deliberate, consequential manner, beyond tactical, rote execution. But where the real magic lies, and what truly separates the “newbies” from masters and experts is the emergence of “alchemy” in practice, for lack of a better phrase. This is the sublime, intuitive, woven-within-you sense of design as a true art. Not art like funky paintings. Art as in a deeply connective, strategic, internalized sense, a lens upon the world of action and reaction, which natively guides your outlook, your habits, your conversations, your interactions with systems and process and culture in terms of Design (yes, with a capital D). It takes beyond just 10,000 hours, true, but also continual deep reflection on one’s practice, useful assessment of insights over the years, cultivation of one’s own ethos of a design philosophy with testament and conviction. This alchemy (the elusive yet magical blend of mechanics and mindset into something uniquely personal and very powerful in practice) involves a powerful sense for adaptation, the ability to anticipate and adjust dynamically per some as-yet-unforeseen circumstances, or awareness of certain attitudes, contingencies or other parameters. And along the way, even invent or re-invent as the case may be, on the fly. Truly intelligent improvisation that’s contextual and still resonant with the needs of the moment. So…back to the original question: I’m not sure memorizing & executing a “formula” for design make one a designer. It’s a very nice and useful start, of course. It’s just the first step towards a richer, deeper journey of actualizing one’s abilities with an emerging art for doing it at a level of intuitive mastery, if one choose that journey. That journey takes significant time, practice, patience, and exposure to a wide variety of situations, guided by a reflective sense for self-improvement and adaptation to what’s possible. 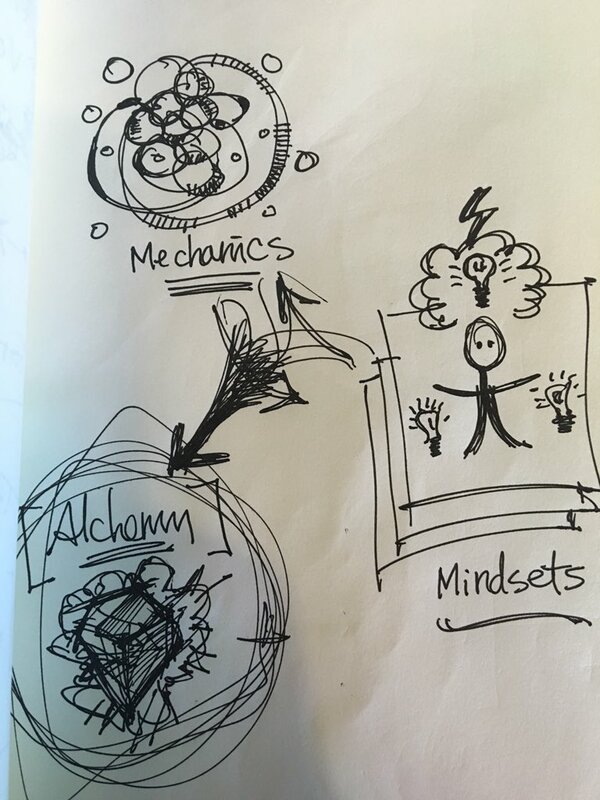 Understanding this dynamic of mechanics and mindset at play in your own work over the years is perhaps an essential aspect towards becoming a fully formed and masterful designer who can turn difficult challenges into beautiful moments of preferred change, who simply exudes this transformative sense of “alchemy”.